As newcomers to the field of Biomass, we are privileged to work with some of the largest land owners in the region. 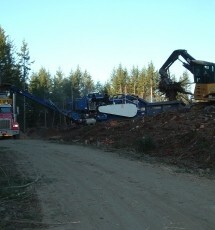 Joel Olson Trucking, Inc. has the potential to function as the largest producer of biomass in the Pacific Northwest. The diversity of our equipment allows us to start the process at the forest floor and carry it all the way to the mill, moving a total of 2,250 green tons of wood residuals per day. For further details please contact Darin Olson at 360-694-8610.